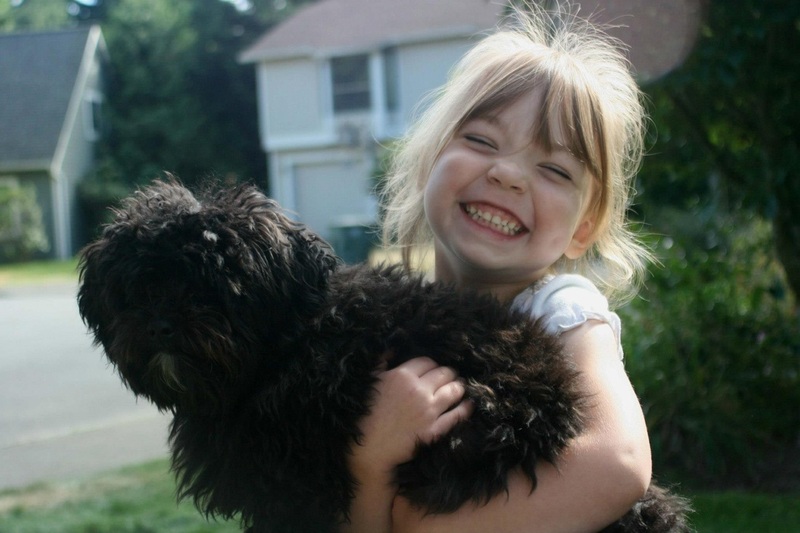 I sat on the step of my front porch, watching my four-year old daughter, Erica, as she was playing with our neighbor's dog. It was time to make dinner, everyone would be hungry and complaining soon, but I just couldn't tear myself away from watching the girl and dog. The sounds of her laughter, intermingled with the joyous yips of the little black puppy bounced off the grass and seemed to fill the culdesac which we lived on. They were currently chasing each other around in circles, the dog making almost instantaneous changes in direction and reversing the circular pattern, teasing my giggling girl who could not possibly keep up. Her short legs tripped over the grass, the exertion creating a ruddy pink flush in her round cheeks. "Ebony!" Erica called out, gasping between laughs, as the pup darted again in another tangent, sending Erica spinning. I laughed too. Nothing could warm a mother's heart more than seeing her child blissfully happy. The stress from the day, all the pent-up frustration from working with irritable patients, along with the physical exhaustion associated with leaning over a dental chair for nine hours, all seemed to melt away, dripping off my person and depositing itself onto the pavement below my feet. The longer I soaked up the joy shared between my daughter and the neighbor's dog, the more at peace I felt with the world. We had only just pulled into the driveway, arriving home at the end of a long day. Before the car was even in park, Ebony was outside Erica's door yapping excitedly. Erica quickly slid the door open and was off playing with her little buddy. This was the new routine. Our neighbor, Denise, was always out in the yard, working in her garden while Ebony would chase insects and run laps around the dogwood tree with the white blossoms. As soon as she saw our car coming around the corner she would start barking and jumping excitedly in our driveway. Then, when a car door was opened she was jumping on our legs and yipping happily. It was our own little welcome party every evening. Tonight I hadn't even made it into the house. Too tired to care, I had sat right on the porch step in my grey and blue scrubs. Obviously hearing the commotion, my husband Eric came out the front door and sat down next to me on the step. "What are you doing?" he asked, even though the answer was apparent. "Sitting," I replied, and then sighed blissfully. We watched the two play-pals scampering around in the grass. Denise was still weeding in her garden, but she would look up every once in a while and let out a little chortle of amusement. "That kid needs a dog," Eric said for probably the hundredth time. I sighed again, this time not so peacefully. We had been over this so many times. "Every kid needs a dog," Eric muttered under his breath. "Hey, not every kid," I said. "I never had a dog growing up, and look how I turned out." "Yeah, look how you turned out, you animal-hater," he responded, but he chuckled and bumped my shoulder with his teasingly. "I am not an animal-hater," I retorted. "It's not my fault that I'm deathly allergic to all of them." "Nah, you're just pretending," he said. "You're just faking all the sneezing, drippy noses, and red eyes." "Hey, what can I say? I'm good at what I do." Although he teased me about it, he knew that owning a pet was not an option for us. We had tried it before with abysmal results. Seven years earlier we had acquired an adorable black kitten, with soft white paws and a star on his nose. I had only been able to tolerate living with him for a year before my allergies became so severe that we had to give him away. When my oldest daughter, Heidi, was ten years old we got her a black hamster which she named Little Bear. The kids had a lot of fun chasing the little fur ball around the house until the week that my daughter was gone to fifth grade camp. I neglected to feed or water the poor creature and it didn't survive. I almost bought her a new hamster to cover up my mistake, but then decided that she would probably figure out the truth immediately. We held a simple burial service in the back yard instead, placing three large stones in the soft dirt to mark the spot. Thinking that it was a no-brainer, our latest venture was an aquarium. The fish did not last very long, however, owing mostly to the fact that one fish in particular seemed to enjoy eating the others. The kids soon lost interest in the quiet, non-furry and non-cuddly creatures, so that when the last fish finally died we got rid of the tank altogether. No, it was much better to have a next-door type of pet. Similar to the joys of being a grandparent, with all the fun of spoiling the little tykes and none of the responsibilities associated with it. Erica could play with the dog all she wanted, but we did not have to walk her, or feed her, or clean up her messes in the grass. We could simply give the dog a farewell pat on the head and go into the pet-free environment of our house. Except that Erica never seemed to want to leave Ebony. She asked to play with her all the time, and when it was time to come inside for the night, a serious meltdown would occur. 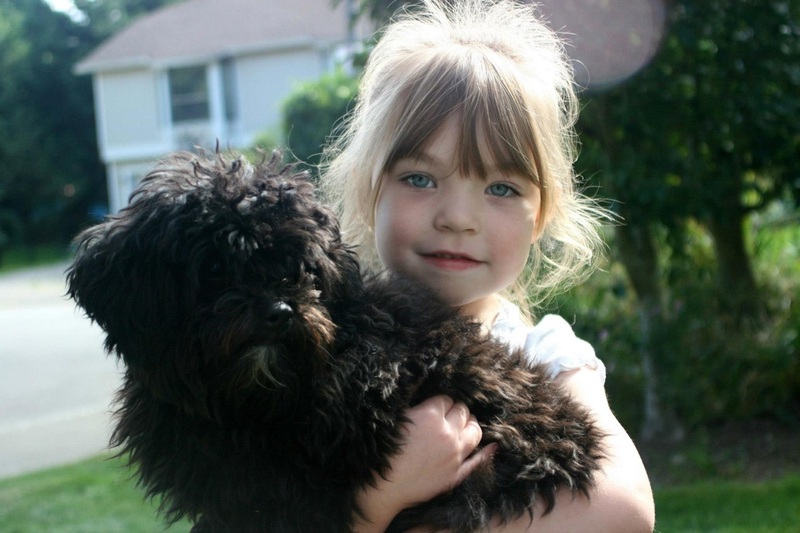 She loved that dog and Ebony loved her right back. The next day I was washing the dishes in the kitchen, while Erica was playing outside in the backyard. It was a beautiful day and all my doors and windows were open to take advantage of the cool breezes which would occasionally sweep through. Suddenly I heard the front door slam shut and the unmistakable clicking of puppy paws on the hard wood floor. I turned to find Ebony rounding the corner into the kitchen, with Erica right on her heals. "Ebony's here to play with me!" Erica stated proudly. "Umm, I don't think so," I said, bending down and picking up the little dog. Ebony gave a cheerful yip and licked my hand. I took the dog out through the front door, thinking that Denise was probably working in the garden and that Ebony had followed Erica into the house. There was no one outside. "That's strange," I thought. I started to walk across the yard and up our neighbor's driveway. Before I reached her front door, however, Denise came running out, breathless. "Are you missing something?" I asked, laughing, as Ebony squirmed out of my arms and ran over to her, yipping and jumping on her legs. "You won't believe what just happened!" Denise said, after greeting Ebony with a loving scratch behind her soft ears. "I was napping on the sofa, when I was woken by Ebony barking at the end of the hall. Suddenly Erica walks right past me, picks up Ebony and takes her out through the front door. For a few minutes I thought that I was dreaming, but then I realized that I was awake and that Ebony was gone!" My jaw must have seriously dropped to the pavement. "Erica was in your house?" I asked, dumb-founded. "And she took Ebony?" "I guess so. It was all so strange, because I had just been asleep...."
I could not have been more mortified. "Oh, Denise! I am so sorry! I will need to talk to her about this. This is unacceptable." Denise seemed to take stock of the situation then, and started to chuckle. "It's okay, really. I know she loves that dog. She probably just wanted to play with her." I apologized all over again, letting her know that I was taking it seriously. It would never happen again. Back in the house, Erica stood in front of me, her face downcast and tear-stained. I was just explaining to her that we cannot go into our neighbor's houses, and we certainly cannot take their puppies home with us, no matter how much we love them. "But Ebony wanted to play with me!" she cried, her bright blue eyes brimming with large wet tears. I sighed, not sure if my message got through to her. When Eric got home later that night and was told about the puppy-napping incident, he immediately began to laugh. "This isn't funny!" I cried. "Our daughter is turning into a felon, and all you can do is laugh?" "I still can't believe she walked into their house," he replied. "Denise must have been in shock." I couldn't help but chuckle over the scene playing through my head. Denise, in her sleepy state seeing a phantom child whisk away her precious little pup, and then jolting awake several minutes later to discover that it was her precocious neighbor girl. "Maybe we need to get her a dog of her own," Eric said, unhelpfully. Again. "You know that we can't," I said. "We would fall in love with it, and then I would get so sick I couldn't live in my own house. Then we would have to give it away and it would break all our hearts." Over the next few days I kept a vigilant watch over Erica, only allowing her to play in the fenced backyard, but she proved to be a highly capable escape artist. The doorbell rang, and there was Denise standing with Erica and Ebony. "Erica!" I cried. "You were just in the back yard!" Apparently, Erica had shaken the gate open on our side of the yard, found a hole in Denise's fence which was covered with vines and a low hanging tree, and slipped into their back yard. She had then walked right through her back door into the kitchen and started to take Ebony out the front door with her. This time, Denise caught her. What was I going to do with my child? Denise laughed and was very nice about everything, but I just wanted to sink into the earth. I was so embarrassed. We had many long talks about going into other people's houses, uninvited. Then I started to get paranoid and had to cover the topic of stranger danger and not going near anyone at all. What if she marched right in to someone's house that was dangerous, or if she walked off with someone who was supposedly looking for their "lost puppy?" My paranoia seemed to rub off on her, and she was constantly on the lookout for "bad people." When we were driving in the car one day, Erica heard police sirens and said that "the police were going to get the bad people, so they don't take me away." I knew at that point that it had gone far enough. We needed a new tactic. A lovely pink tricycle, decorated with several popular princesses and shining tassels streaming from the handlebars was just the trick. Now as I sit on the front porch, the culdesac is once again full of my daughter's laughter. She is pedaling merrily on her princess bike, and although it is still difficult for her little legs to push the pedals in a full rotation, she doesn't seem to notice. Ebony is jumping around her feet, making her progress slow, but the yips and laughs make it clear that the two of them are enjoying themselves. Ebony starts off in a quick lap around the bike, egging Erica on to go faster. She pushes her legs down harder, propelling the bike forward in a smooth and quick movement and Erica squeals in delight. I close my eyes and soak in the sounds, letting the outside world just melt away. Erica, with her buddy Ebony. The above story is based on one of Heather's favorite memories of her daughter growing up, written in story form. All characters are real people and a real dog. No animals were injured during the making of this story, except of course the hamster, the dead fish, and the poor cat whose fate is unknown.